If you've been been waiting for the BlackBerry Bold 9780 to hit a US carrier then tonight is the night. 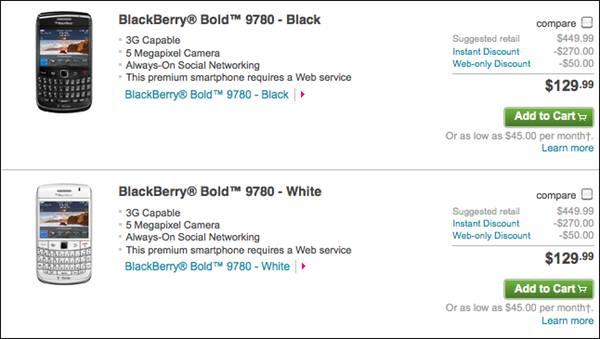 T-Mobile has now posted up the BlackBerry Bold 9780 in black and white. $129.99 with a new 2 year contract and it's all yours. if retail price is more your style and you like not having a contract then you'll be looking at $449.99 as your final damage. Some areas are still showing the device as back ordered but, other areas show it as available. Our guess is that it's still filtering through the site so if your zip isn't showing it as available yet, it will be shortly.